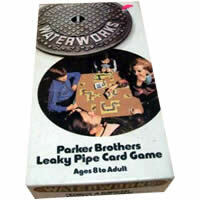 Waterworks, the family game let's you become the plumber and have a chance to put pipes wherever you want. Find a way to connect the faucet with a spout, it's a competition to be the first to get this done. Are you going to work on your own pipes or are you going to try to sabotage your opponents? You and your opponents can create distractions by putting leaky pipes on each others pipelines. Too bad these leaks have to be finished before you can keep building. Waterworks will have you doing your best to build your pipeline before your opponents, while trying to slow them down. Check out Waterworks for a fun game and do your best to be the master plumber. The object of the game is to be the first player to form a continuous pipeline (with no leaks) between his faucet valve card and his spout card. The Water Works equipment consists of a deck of 110 pipe cards, 1 bathtub card tray and 10 metal wrenches. The deck contains 3 kinds of pipe: copper, which can never leak; lead, which is vulnerable to leaks, and lead which is already leaky. There are 6 different shapes of each of the 3 kinds of pipe. Waterworks also comes with the official rules and instructions sheet. Please keep in mind that the official Water Works party rules and instructions could be different depending on the game version you have. The rules below are some of the exact directions on how to play Water Works. Share with us your comments, funny stories, tips, advice, strategies, creative ways to play, questions about how to play, problems with the rules or anything you want about Water Works. All submissions will be reviewed within 24 hours. Click here to add your Water Works comments. We picked up the newer version of this game but I'm assuming the rules are the same. Fun to play with your family and even younger kids. Water works is a game wet like to take on vacation since it's quick and easy to store. We've even had a few people stop us and ask what game we're playing.